Classic master bath remodel "AFTER"
A home owner asked me to totally make over her traditional master bath. She wanted it to blend with the rest of her traditional home, but updated & fresh. We visited several showrooms to see natural stones, ceramic & porcelain tiles. She fell in love with this green onyx slab. With this as our starting point, the design was created to feature this beautiful material. We removed everything down to the studs. A large recessed tub was replaced with a walk-in shower with a linear drain, seat, new plumbing fixtures and a frameless shower enclosure. This will provide ease of access for many years to come. In the shower, the green onyx tiles are accented with glass tiles creating a beautiful focal wall. The onyx slab is the countertop and splash for the double sink vanity. The sink faucets have a sculptural design. The contemporary cabinet provides a generous amount of storage. A new mirror is accented with an artistic wall sconce of cream alabaster. The flooring is porcelain throughout the room. 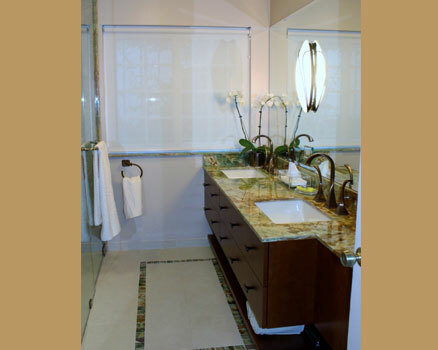 An “area rug” in the green onyx separates the shower from the vanity. All the light fixtures are LED. She was over joyed with the final result.